This is a brand new Borg Warner (OEM) Left or Driver Side K03 Turbocharger for the B5-S4, C5 A6-allroad 2.7T. If you have had a stock turbo failure, and are looking to get your car back on the road and maintain OEM reliability this the optimal option. 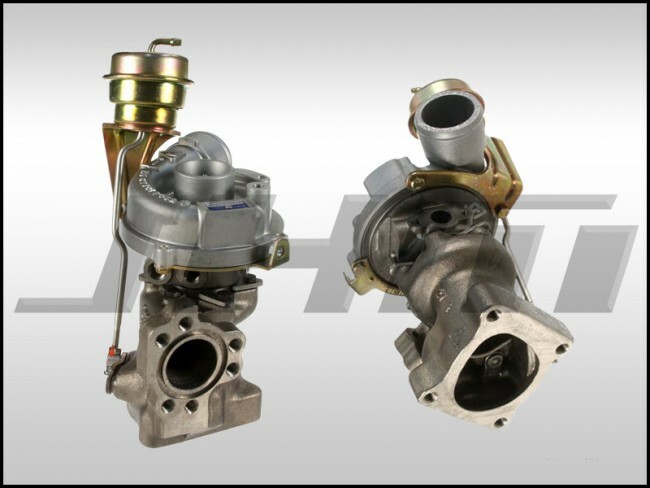 However, if you are looking to take this opportunity to add performance with upgraded turbochargers, please go back one section and check out the JHM RS6-RS Turbocharger Kit! As turbochargers age, the internal seals go bad causing excessive oil in your intercooler or a mixture of oil and coolant. The journal bearings can all wear out, which will cause the compressor fins to touch the compressor housing which generates the infamous "Dentist Drill" sound which is an indicator that the turbo is failing. If you are unsure whether or not you are experiencing turbo failure, don't hesitate to contact us for help! Sales@JHMotorsports.com or (209) 968-0077. NOTE: There is a split between years 2002 and 2003 for this turbocharger on the C5 A6 and allroad. This turbocharger will only fit VINs up to 4B-2-200000. If you have a VIN starting with 4B-3-000001 and on this turbocharger will not fit your application. If you need the later style turbocharger, please contact us for pricing. Borg-Warner warranties any failure due to manufacturer defects for 12 months. In the event that a turbo purchased direct from JHM is not performing to manufacturer specifications, the customer will be responsible for purchasing a replacement until the warranty review process is complete if they are not willing to wait until the review is complete. The malfunctioning part will then be sent out for warranty inspection immediately after it is received by JHM, at which time we will wait to hear from Borg-Warner as to whether the item failed due to manufacturer defects or for other reasons. The most common reasons of a rejected warranty for any turbo but not limited to are: oil pressure and/or feed lines that have excess sludge or deposits in them thus releasing deposits into the turbo and causing failure - oil pressure and/or feed lines that are plugged or partially plugged thus restricting oil to or from the turbo causing failure - damage caused due to improper installation - poorly maintained engines that have oil sludge and deposits that get released into the new turbo. After inspection if the suspected defective turbo is determined to be truly defective by the manufacturer you will be sent back a replacement or refunded for the amount of the replacement you purchased if you bought one in advance as previously stated. (excluding shipping). JHM and Borg-Warner are NOT responsible for the labor costs associated with the install of these items nor the labor costs associated with replacement of warrantable parts. For further information please contact JHM.